YUM! We made the easiest healthy cookie recipe ever! Seriously, we promise! It’s brought to you by our amazing blog partner, SupaBarn. Be sure to check them out for all your local grocery and health food supplies! By now you Merrymaker Sisters probably know we’re cookie crazy. Seriously, we (and by we, we probably mean mainly Carla) LOVE to bake up batches of cookies all. The. Time. This is why we HAD to share our brand new easiest healthy cookie recipe with you! Especially when we’re supposed to be doing other things. Apparently, it’s called ‘procrastibake’ yes, it’s totally a thing and we are particularly good at it! Anyway, we feel like we could never have enough healthy cookie recipes on the blog and Get Merry app, would you agree? 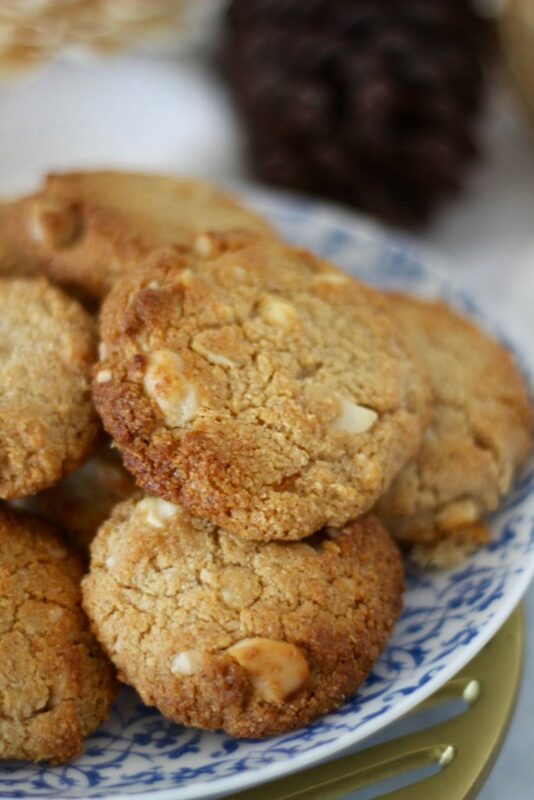 We thought so… today it’s all about Macadamia and Cinnamon Cookies. Pretty much a winning combo. BUT with the added benefit of there only being 7 ingredients and taking 20 minutes to make and bake… it’s time to put your aprons on and get baking! Another reason why we wanted to make the easiest healthy cookie recipe during November is that December is next… which means Christmas is around the corner! You all know we’re all about them home-baked presents and these cookies are pretty much the IDEAL homemade gift. Make a batch, pop on a pretty plate and you’ll be the favourite for sure. If you want more cookie recipes though, we have another 20 here you’ll also love! If you do make them, let us know and share a pic with us on the socials! We love seeing all your creations! 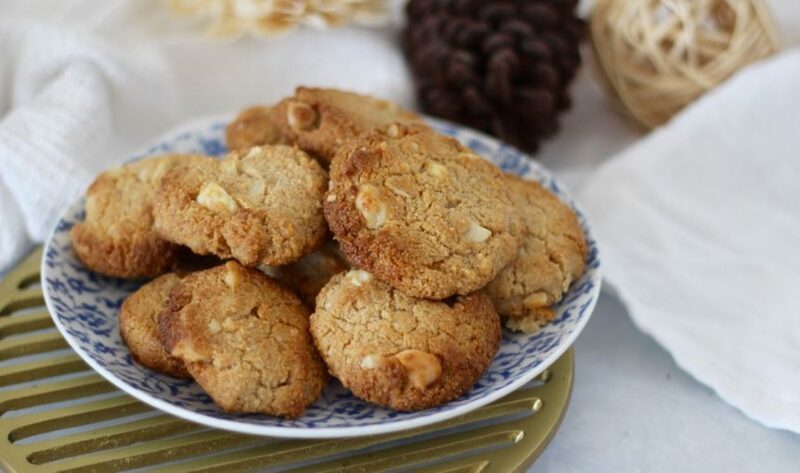 You'll love these Macadamia Cinnamon Cookies! They're seriously the easiest recipe ever and taste oh so good! Make a batch on a Sunday to have cookies all week long! You can find all our recipes on our Get Merry Recipe app plus 100+ app exclusive recipes! In a large mixing bowl, place the almond meal, macadamia nuts, coconut and cinnamon, mix until combined. In a small bowl, place the melted butter, syrup and vanilla, mix until smooth and combined. Add the butter mix to the dry ingredients and mix until a sticky cookie dough forms. With wet hands, roll tablespoon fulls of dough and place evenly onto the baking trays. Flatten the cookies down with your palm and then smooth the edges with your fingertips. Place into the oven for 10 minutes, keep an eye on them as they burn quickly and ovens can differ. Allow to cool completely before enjoying or decorating with yummy things! MERRYMAKER TIP: feel free to swap macadamias to your fave nut! Anything goes and anything would be delish!